We got into the rental industry because the traditional way of renting was a long, difficult process. By bringing the process online, giving you a wedding management system and world class customer service, we've made this easy. When should I place my order for my wedding? Honestly, as soon as you know your event date. If you need to rent for an event that is fewer than sixteen (16) days (21 days for AK, HI) from the time of order, please contact us for assistance setting up your event. How does the fitting work? All we need are a few answers to questions about your body profile including age, height, weight, shoe and jean size. 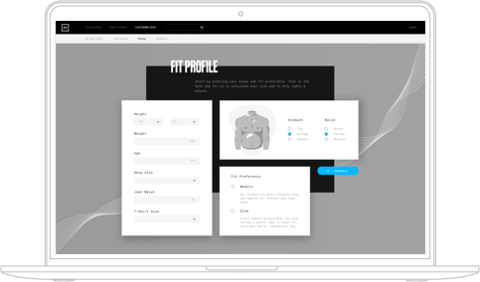 Using our sizing algorithm, we'll determine the right fit for you. For customers aged fifteen (15) and under, we'll ask for specific measurements. All you need is a tape measure and a friend. If you don't have a tape measure, we can send you one. Then just follow our step by step guide and save the measurements in your profile. When will I get my order? Is there enough time? You will receive your items about 14 days before your event. This allows time for you to try the garments on and contact us with any fit issues. If needed, we will send FREE replacements to you right away. Do you have tuxes for kids? We do offer sizes for the little guys for some of our styles, and the process is the same. Contact us if you have specific questions! Create your look, enter their age and measurements, and checkout. Do you have big and tall sizes? Absolutely. In most of our suits and tuxes we can go up to 66L jacket sizes and 60 inch waist pants. Can I see the look in advance? Menguin offers a free Groom's Home Try-On. You can build the look you want and we’ll ship the garments out to you for a free 48-hour trial. Click here or contact us if you are interested! You will receive your items about 14 days in advance of your event. If any items do not fit, then we’ll send you free replacements right away.